Label and pressing variation. Green label pressing with 'WB' logo, pressed by Columbia Records Pressing Plant, Terre Haute as indicated by 'T 1' in runouts. Labels state "Produced by Bob Matthews and Betty Cantor in association with the Grateful Dead". Includes Artisan Sound Recorders logo in runout etchings. 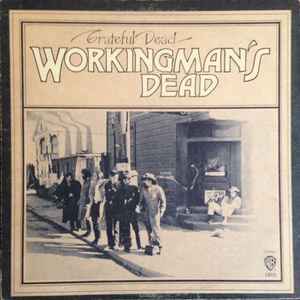 Differs from Workingman's Dead which has "Executive Producer: Bob Matthews" text on labels and 'KD' in runout etchings. Rough textured cardboard cover, with rear slick pasted on upside down. Recorded at Pacific High Recording Studio, San Francisco. Engineered by Alembic. Warner Bros. Records Inc., a Subsidiary & Licensee of Warner Bros. Inc., 4000 Warner Blvd., Burbank, Calif. · 488 Madison Ave., New York, N.Y. Made in U.S.A. © 1970 - Warner Bros. Records Inc.